In 1909 Richard M. Bradley, owner of Boston’s Bradley Real Estate Company, built this two-story office building and hired Duluth’s William M. Prindle Company to manage it. The original architect is not recorded; Frederick German and Leif Jenssen designed a 1924 addition that increased the building by two floors and added a new façade of brick, tile, and terra cotta. The four-story, Commercial-style building had a flattened corner and few decorative elements except for classical detailing along the cornice. 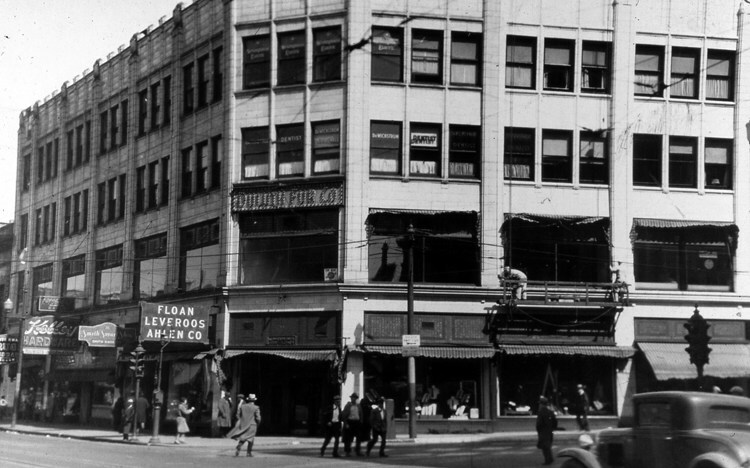 During its lifetime the Bradley’s first floor was home to Kelley Hardware, (sponsor of Duluth’s NFL franchise, later known as the Duluth Eskimos), White Swan Drug Store, Smith Shoe Company, the Duluth Fur Company, and Floan-Liveroos-Ahlen Company, a clothing store for men. The upper floors had professional offices and from 1937 to 1966 housed the KDAL radio and television studios. WDSE-TV occupied the KDAL space from 1966 until 1978. In 1979 the Bradley Building was demolished in order to widen Lake Avenue and turn its viaduct into a highway overpass for the expanding I-35. Today what remains of the lot is occupied by an entrance to Lake Place Park and the Lakewalk and features the Lake Superior Fountain by local artist Ben Effinger.